One of the biggest mistakes you can make as a writer is to think your work does not need editing. Whether you’ve been writing for 20 years or 2 years, the fact is your work can still be improved. Even best-selling authors like Stephen King and J.K. Rowling rely on editors before publishing their work to the masses. 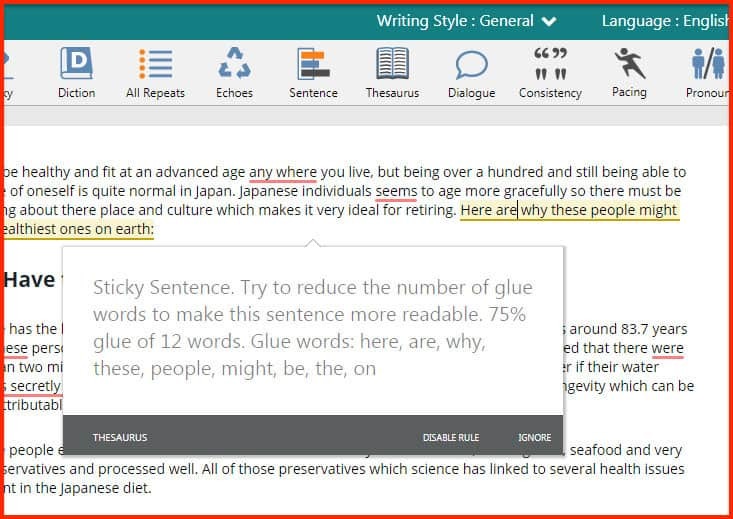 For the rest of us who can’t afford professional editors, there are free editing tools like Grammarly, Hemingway, Ginger, or the built-in grammar checker in Microsoft Word. These tools are great for catching major grammar and spelling errors. But what if you want to really learn the rules of writing and not just blindly accept corrections from an app? Is it possible that such a basic editing tool could help correct your mistakes and help you understand where the mistakes lie? For this, look no further than ProWritingAid. 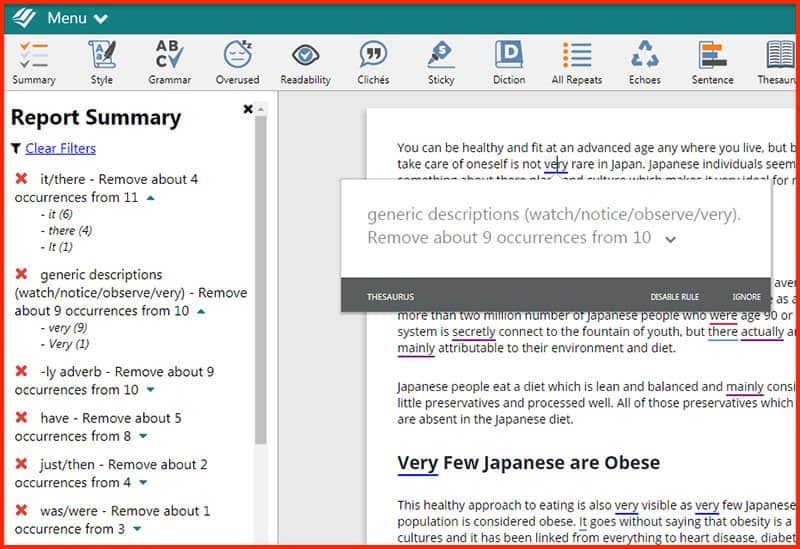 This robust tool is more than just your average grammar checker. 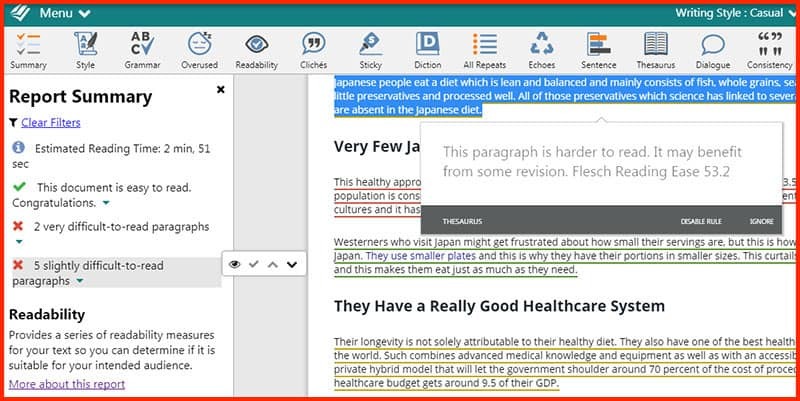 It not only scans your work for typos but also tells you about other things such as overused words and paragraphs that are hard to read. ProWritingAid has both free and paid features. The free web-based version has a limit of 500 words per document. 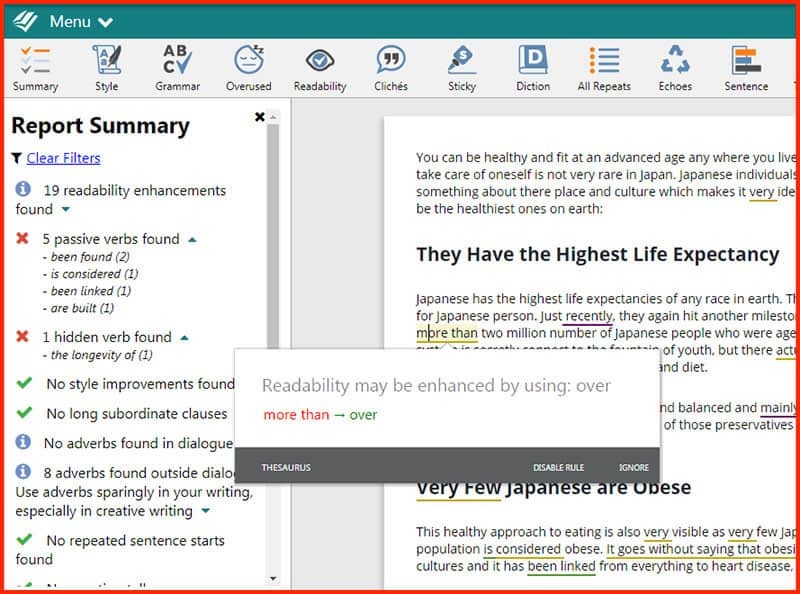 An upgrade to the premium version is required for unlimited word counts and a licensed add-on for Microsoft Word. If you want to experience all premium features, you can request a 14-day free trial (no credit card required). You can open ProWritingAid’s web-based editing tool in your browser or install its add-on for Microsoft Word or Google Docs (premium account sign-up needed). Once this is done, you can either start typing your text, upload a file, or copy and paste from another source. Once you’re done writing or putting in your content, you can run a series of reports by clicking on the Summary button on the top-left corner of the screen. If you have low scores on Grammar and Style, then it makes sense to run both Grammar and Style checks (separate buttons on the upper toolbar). Each button on the toolbar will run a report on your text. These reports will tell you what you need to change or improve in the content. All reports will give you a summary on the left side of the screen. You can expand each section to see a list under it. Hovering your mouse over an item on the list will show a toolbar to either view, hide, or point to the word(s) in the document. There is also a brief explanation of what each report is about on this same panel, and you can see it at the very bottom. There is a link to learn more about the report, which will lead you to a longer article on ProWritingAid’s blog page. Grammar and style are probably the two most basic aspects of proofreading, so I think any kind of content needs to go through both these checks. 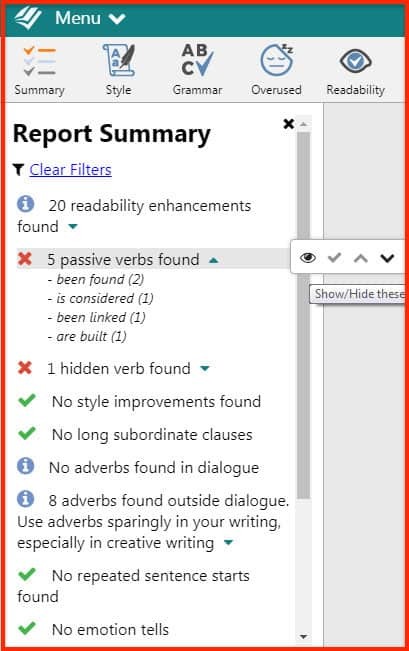 As you can see in the example below, ProWritingAid provides a clear definition of each rule as shown on the left side of the editor to write content. The suggested changes are underlined, and if you click on the word, you’ll see what changes need to be made to correct an error. 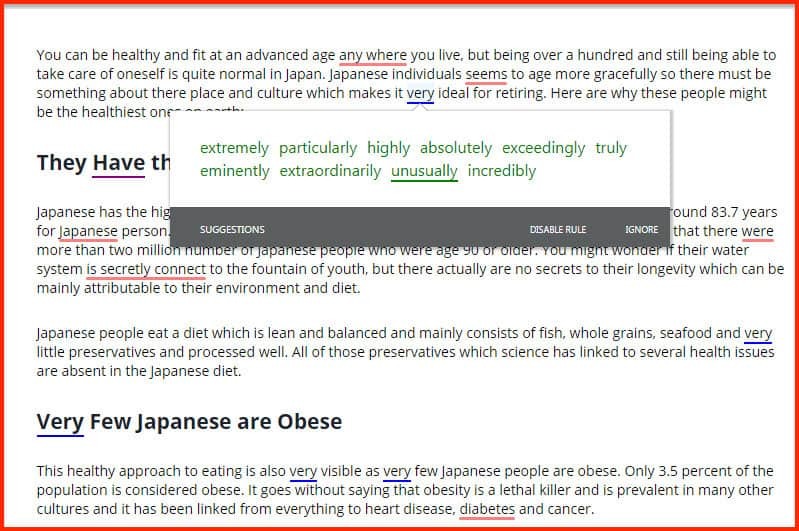 Clicking on the correction will implement the change, a familiar feature with other editing tools like Grammarly. The grammar report checks for spelling, sentence structure, punctuation, and tense usage. 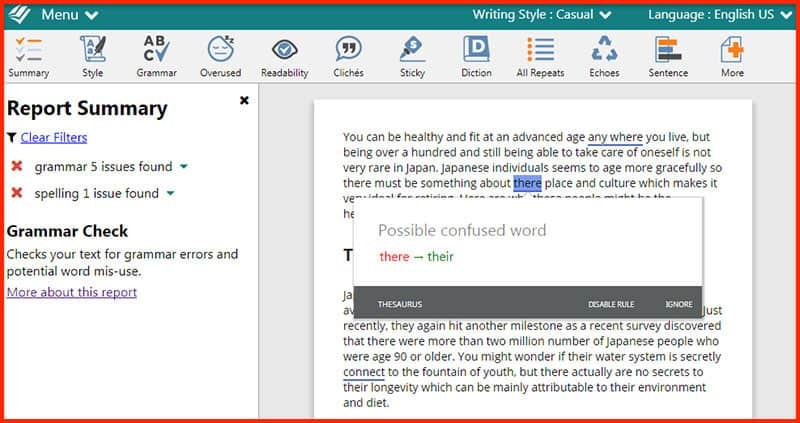 The style checker highlights sections of the writing that can be improved. Anything not covered under the grammar check will be covered here. This report checks for individual words and how often they are used within the entire document. As you can see below, my report says that the word “very” was used 10 times. From this report, it’s clear that you’d want to replace or delete these overused words. Now you can use the Thesaurus. Click on one of the overused words and then click Thesaurus on the bottom left of the pop-up box. You should see a list of suggestions to replace the word. This is one of my favorite reports from this tool. It tells you whether a paragraph is easy or hard to read. The tool uses the Flesch Reading Ease formula and returns a score of one to 100. A high score indicates that a written work is easy to read. They are all indicated by different colors used to underline each paragraph. A low readability score may actually be okay if you’re writing academic documents, but not if you’re writing for the general public or for a blog. 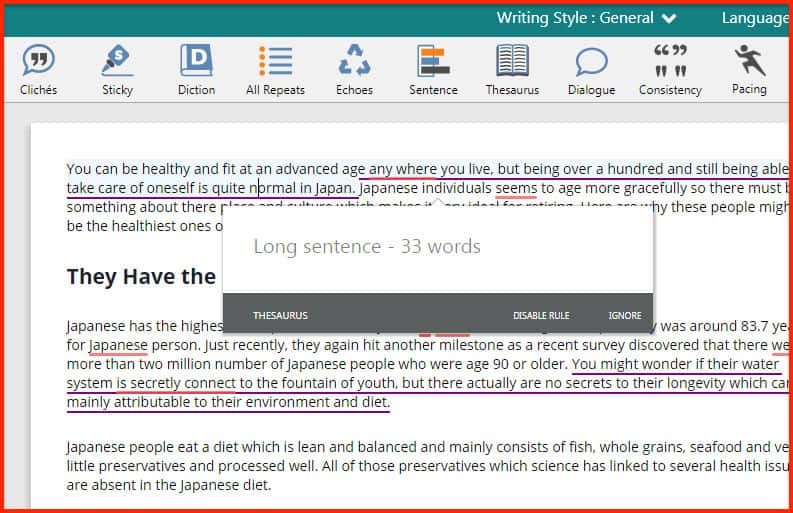 Another notable feature of this editing tool is the detecting of “sticky sentences”. These sentences contain “glue words” that delay the reader from getting to a sentence’s point or thought. Glue words can be taken off of a sentence without taking away its meaning. This feature isn’t something I’ve seen in other editing tools. The Consistency check is the tool’s way of making sure that you use the same rules all throughout the content. This includes spelling, hyphenation, capitalization, and punctuation. So if you used italics to indicate a book title in the first part of the text but then used quote marks the second time, it will show on this report. This is important if you’re following a specific style such as AP or Chicago Manual. I’ve seen Grammarly correct punctuation use and I’m always guilty of not using the serial comma. In this tool, however, you’re given a breakdown of your inconsistencies. One writing technique I’ve come across is to vary sentence length. A series of short sentences will sound ridiculous, while a series of long ones will be difficult to follow. It makes sense to alternate short and long sentences for a more natural writing flow. When writing, you may lose track of your sentences and how long they are. This tool in ProWritingAid will help you track down which sentences are obnoxiously long. You can check the average sentence length on the left panel. A breakdown of sentences by word count will also be shown. From here, you can make some changes as you see fit. Conclusion – Is ProWritingAid Worth It? ProWritingAid is a powerful tool which can help you improve your writing. While Grammarly has a simpler approach, ProWritingAid goes in-depth in analyzing content beyond the basics. It’s not just for casual writers; it’s also for those who are not afraid to learn the complex rules of writing. While the tool can give you a very thorough editing process, it’s obviously not for content that’s not uploaded or copied on its web editing interface. This means it won’t edit your social media posts or emails. For this, it’s best to go with Grammarly or Ginger. 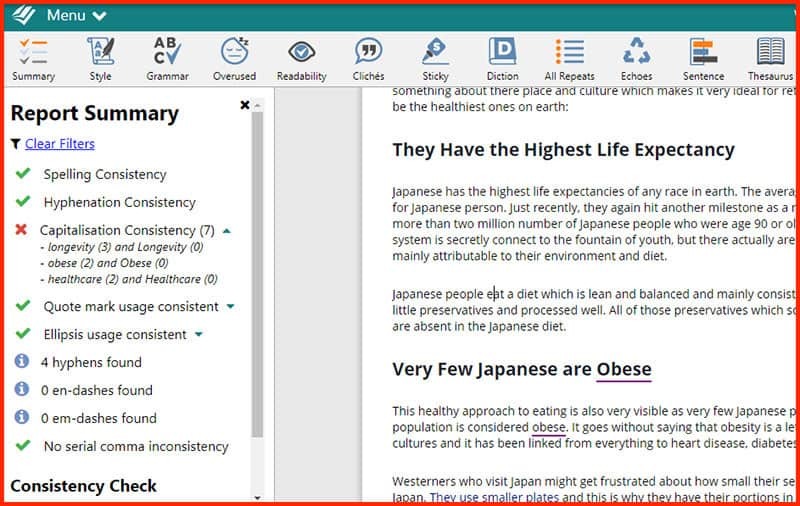 But for final edits of long documents like books and reports, ProWritingAid is a much better tool for the job. 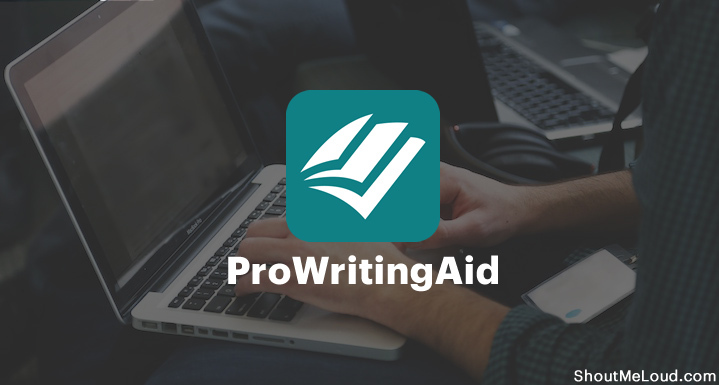 Check out ProWritingAid now and claim your free 14-day trial. Have you used ProwritingAid before? Share your review and experience with us in the comment section below.